Nowadays, images are an indispensable part of the web. However it wasn’t always like that. Only in 1993 the Mosaic browser would introduce images along with content in web pages. Some formats, like GIF and JPEG, already existed in that time and others like PNG and SVG, would only appear in the 90s. Images are used for multiple purposes, like showing pictures, branding, illustrations, charts and many other things. Because of this variety of use cases and formats, sometimes choosing the right approach can be confusing. Should logos be SVG or PNG? A screenshot, JPEG or PNG? How good the quality of an image can be without generating a file too large? Understanding how each image format works and what are the trade-offs for each one can help answering these questions. 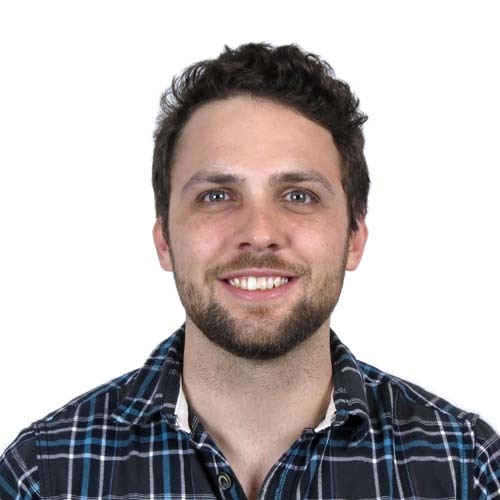 Over the past years, working with both digital design and front-end development, researching and testing different tools helped me to clarify some of these questions. 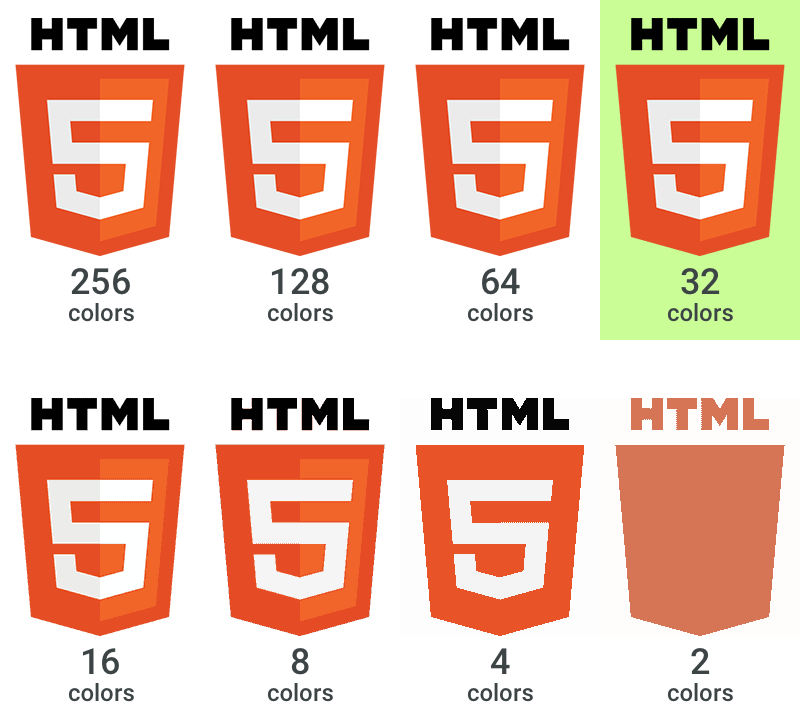 In this article, I’ll show a little bit about how each format works, in which aspects each one is good at and ways to compress and save them for use on the web. Created by the Joint Photographic Experts Group in 1992, and named after them, JPEG is a lossy raster image format, which means that every time a compressed JPEG is saved, some information will be left behind, irreversibly. JPEG takes advantage of flaws in the perception of the human eye — we tend to be more sensitive to lightness than to colors — so it uses a compression algorithm that discards information we are not good at perceiving, hence the naming “lossy format”. The amount of compression applied to a given image will be directly related to the quality and size of the resulting file. The technical side of JPEG compression goes far beyond this, if you want to go deeper, check out this article written by David Austin. Because it works with luminance and color compression, JPEG will work very well for pictures and other realistic or shaded images like paintings and 3D renderings. That’s why it has been the most popular format to store pictures for years. For the same reason, JPEG will have poor results with graphics, like logos, geometric drawings, screenshots, and others. Pictures and complex or shaded images, like paintings, are good examples of uses of JPEG. Maximum 100% (61 KB), Very High 80% (29 KB). High 60% (16 KB), Medium 80% (7 KB). Low 100% (6 KB), Lowest 0% (3 KB). It’s recommended to work in a range between 50% and 60% on the web, since it will result in a decent quality and a good file size. Metadata can also be stripped from JPEG assets to reduce file size. There are also online tools, like TinyJPG and desktop applications like ImageOptim (Mac) and RIOT (Windows), that can perform compression. In Photoshop, this can be done by selecting “Metadata: None” on “Export” or on “Save for Web ( Legacy)” options. Blurring an image or an area of an image can also result in a smaller file size, as you can check here. Be aware that, due to JPEG’s lossy approach, saving the same file multiple times, even at 100% quality, will result in a decrease of image quality, as the compression algorithms will be applied over and over on the same image, which might not reflect on a decrease in the file size. The Portable Network Graphics is also a raster image format, and it’s been around since 1995. It is different from JPEG, in that it’s a lossless format, and the most common lossless format on the web today — , which means that when a file is saved and compressed, no information will be lost due to the compression algorithm. Two-dimensional interlacing — Instead of showing the image only when it’s fully loaded, images are shown as they load. This option must be used with caution, as it will increase the file size. For a complete list of PNG features, history and technical information, check libpng’s page. PNG is really good for line drawings, logos, icons and images with few colors. Pictures and images with a lot of colors, on the other hand, will result in huge file sizes. Another great use for PNG is when you need to use transparent backgrounds. In that case, even for complex pictures, you can still use PNG, since the transparency feature is not present in JPEG. While the compression algorithms within PNG are lossless, you can elect to reduce its color spectrum and thus decrease size via outside tools. Pngquant is a great tool that does this job, reducing file sizes significantly while keeping its alpha transparency levels. Be aware that this process creates a 8-bit file, which means that the file will have a maximum of 256 colors. It may not seem like much, but it’s possible to achieve good results with that number of colors. 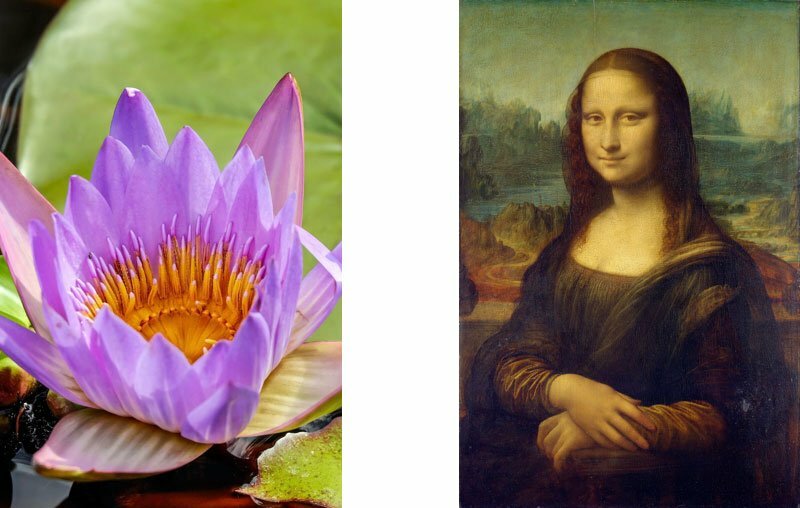 24-bit image on the left (149 KB) and 8-bit, 256 colors on the right (54 KB) — 63.7% smaller. For most PNG use cases (lines drawings, graphics, icons), though, 256 can be more than enough. So, it’s possible to reduce the file sizes even more, by reducing the number of colors in the palette. GUI tools like Pngyu or ImageAlpha, which allow you to preview the resulting file, are a great way to achieve that. Look at the example below how the palette is reduced to 32 colors without compromising its quality significantly. In cases like this, it’s hard to automate the compression because you’ll need to preview and test it until you find the best result with the minimum of colors — and file size. Just like JPEG, there are also online tools for compressing PNG, like TinyPNG. In this example, the logo can be reduced from the original 24-bit PNG (10 KB) to the 8-bit, 32 colors version (2 KB, 80% smaller) without losing any significant detail. See the Pen #1 – Coffee Machine – SVG animation with CSS3 by Jonathan Silva (@jonathansilva) on CodePen. As other vectors formats, SVG graphics are able to scale to any size without losing any detail or pixelating. The same icon, for example, can be used in multiple sizes and will look sharp in any screen density, like retina displays, without the need of multiple files. 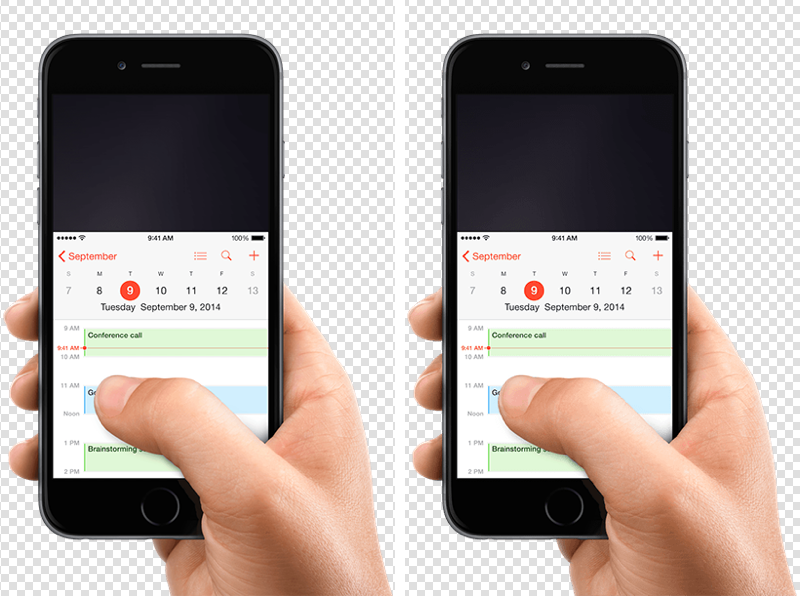 Vector images (right) can scale without losing quality. Logos, icons and data visualization are good examples where SVG can be used. Most of times, compressing SVG files on the web with SVGz (GZipped SVG), for example, is not necessary. You can (and should) implement this Gzipping on the server, and that would be redundant. 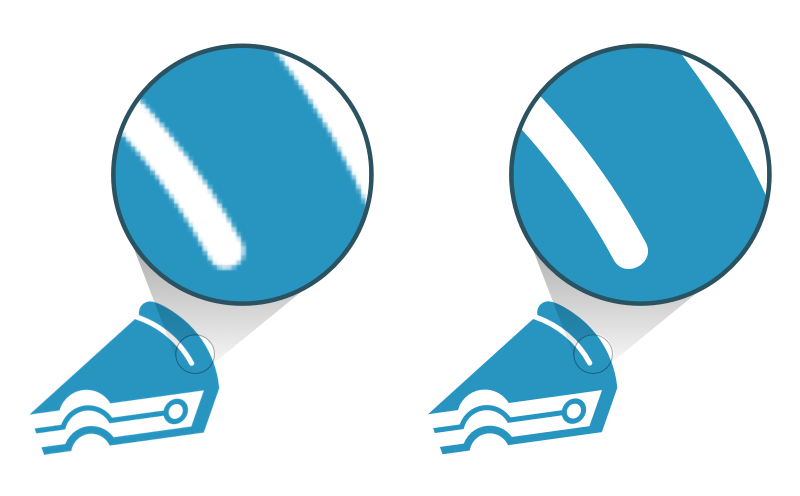 What can be done is to reduce SVG files by cleaning unnecessary anchors, elements and properties from the vector shape. 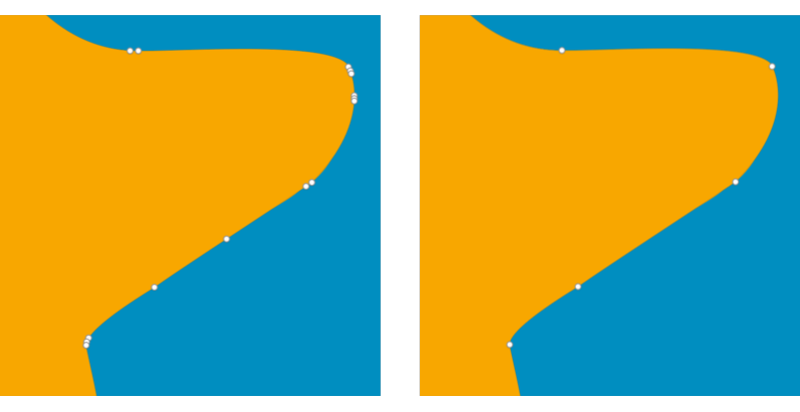 Anchors are what a vector shape is made of, and to do this, you’ll need to be sure that the removed anchors won’t affect the final shape of the vectors. If you use Adobe Illustrator to edit SVGs, make sure to save using Export > Export As… instead of File > Save As… because it will create a minified file, among other advantages. In Sketch, make sure not to use unnecessary folders, as they’ll be exported as an extra tag to the SVG. Cleaning unnecessary nodes is one way to reduce SVGs sizes. Elements are everything that sits inside a SVG file, including the opening and closing tags. Vector editing softwares like Adobe Illustrator and Sketch may export a SVG with unnecessary elements and properties. SVG minifiers can be used to remove this kind of superfluous information. Online tools such as Compressor and SVGOMG can do this job. If you’re a developer, and not used to SVG cleaning and minification, you may want to check SVGO, a tool that automates this job. If you’re a designer, talk with the project’s developer about SVG minification to avoid doing manual work that can be easily automated. In the example below, the icon exported from Sketch has 1,364 bytes. The same icon clean and minified takes only 460 bytes — 66% less. See the Pen SVG from Sketch by Bruno Müller (@brunomuler) on CodePen. See the Pen Optimized SVG by Bruno Müller (@brunomuler) on CodePen. As any other piece of technology, image formats are constantly evolving. Our main constraint, as web designers and developers, is browser support. A few years ago, when IE6 was still around, PNG wouldn’t work with alpha transparency. 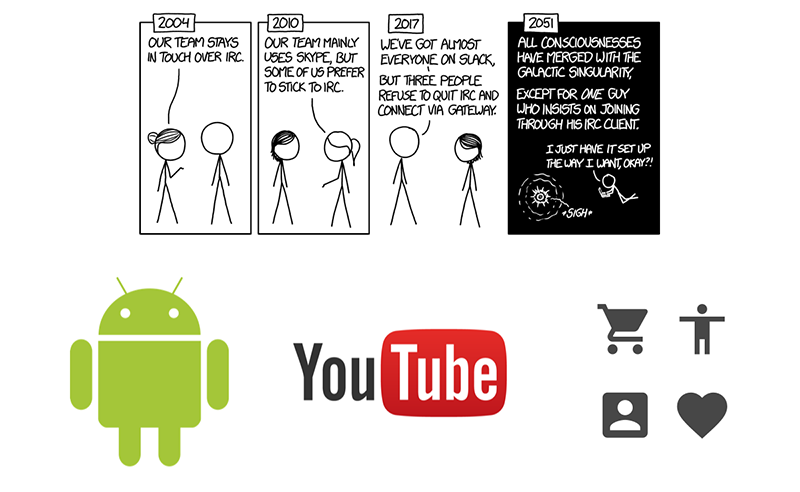 In a near future, maybe we’ll be using new formats like Google’s Webp or others that are still going to be created. Knowing how to use and optimize each format will ensure a better user experience, as users will be able to preview and receive content sooner, spending less bandwidth. It will also allow new possibilities for designers with animations and responsive pages. I hope this article helped to clear some questions regarding the many possibilities of image formats on the web. If you still have any questions or suggestions, please leave a comment below or contact me. And if you found this article helpful, don’t forget to share. Hi, Nice article but… you explained PNG as a raster image format. This is incorrect. It can hold either raster or vector. I have used it for vector for many years. Thank you Thomas. It’s actually the first time I hear PNG being used as a vector file, do you have more information or references about this use? PNG was the native file Format for Macromedia Fireworks (later known as Adobe Fireworks). It allowed vector editing for many years. Just Google PNG vector. Hey Thomas, I think I understand the confusion here: Fireworks used to have a proprietary file type that used PNG extension (Fireworks PNG), and was able to keep layers, vectors and other effects just as PSD or AI files can. Even though the extension is the same, Fireworks PNG is not a PNG file format. The PNG file format is a raster image, as you can check here https://en.wikipedia.org/wiki/Portable_Network_Graphics and http://www.libpng.org/pub/png/pngintro.html . I hope I was able to make it clearer. Thanks! PNG is an extendable file format based on data chunks. Fireworks saves its information in custom chunks but keeps a rastered copy of the image in the default chunks. So it is a valid PNG.